On Saturday I visited the Creative Alliance to see Encounters, Baltimore artist Mia Halton's show of drawings, prints and sculpture. Much of the work was made during Halton's artist residency in Puebla, Mexico, an area known for its centuries old tradition of creating vibrantly colored pottery from its fine clay. Artists in Puebla still create in the “Talavera” style, and Halton worked side by side with the “artisanas” she met at the local pottery factory. Upon ascending the stairs to the second floor gallery, the first thing that struck me upon seeing the large, one room show were the drawings that Halton had made directly on the gallery walls. In Encounters, men, women and children float within the white space- some collected into tight groups, and others seemingly adrift, immersed in their own thoughts. Several figures within the groups look askance at people from different groups, their mouths open and eyebrows raised as if they are about to shout across a great expanse. A man and a woman from neighboring groups point directly at each other, suspended in what could be a heated argument. Playfully drawn in black paint upon an all white background, Halton has rendered her figures in an almost cartoon-like style. While the drawings may appear childlike, Halton's deft lines and engaging compositions are the mark of a confident draftsperson. Each of the simply drawn figures has the weight of an entirely unique personality; with a masterful eye for gesture, the artist is able to communicate the complexity and nuance of her characters in just a few strokes. 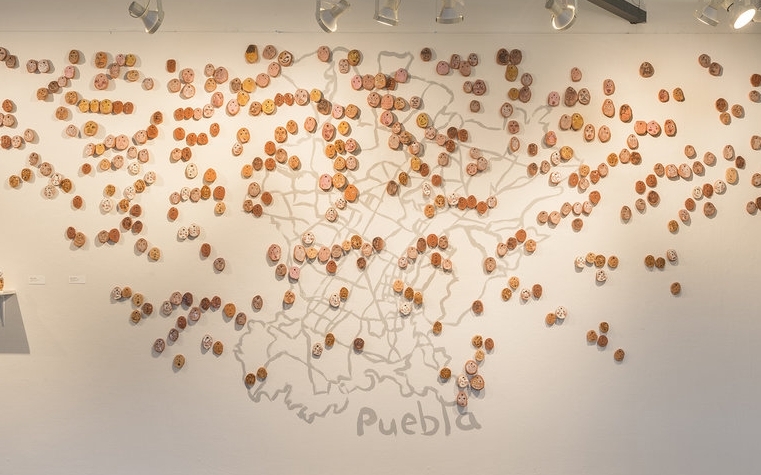 Mounted on another wall are hundreds of small clay faces, which Halton has placed at intersections over a hand drawn map of the the Puebla area. In this piece, entitled Face to Face, the artist has etched faces on flat clay discs (approximately four inches long and three inches wide), in a comic style similar to her drawings. While her drawings exist only on a white background, here the artist has paid particular attention to the color of her clay faces, rendering them in various shades of brown, orange, pink, black and white. Halton has painted each of these faces individually, as if they could be representing a particular person she has met along her travels. Each wears a different expression- some seem enraged, others contemplative, some content. The artist does not specifically tell us the narrative behind each of these characters' expressions- the viewer is left to fill in the details for herself. Rounding out the exhibition are several small sculptures, prints and drawings. One sculpture, entitled Whitening, is a grouping of six free-standing earthenware figures, each about 6 inches tall. The head and shoulders of each figure are covered with a white glaze. The rest of the body is unglazed, and shows the natural light orange hue of the Puebla clay. The figures do not interact with each other, and stand with their arms at their sides, eyes searching the horizon. Although they are standing together in a group, each figure seems in some way isolated, alone with their own thoughts. Halton has rendered the figures in Whitening with such economy that the figures are just barely emerging from their blocks of clay. By emphasizing their substance, the artist seems to be suggesting that, at our most basic, we are all made of the the same earthy stuff. That each figure has been “whitened” from the top down however, suggests another, less tender meaning. The figures' bodies have been painted over- at least partially obscuring their “natural” or endemic color. It is in this way, before even considering the connotations of “whitening,” that the artist portrays the figures as people being acted upon. Halton seems to be asking us “What does it mean to be “whitened?” She has taken great care in detailing the varied skin tones of the clay faces in Face to Face. That all of the figures in Whitening have become one color suggests a universal or cultural phenomenon. Is Halton referencing a “white” culture, and its effects on the people of Puebla? Another wall features Halton's smaller prints and drawings, such as Workin It Out, Four Encounters, and Did You Mean It? These pieces detail intimate moments in the labyrinth that is human interaction; they are spot-on snapshots of the awkward silence, the missed point, the misunderstood joke, the unheard complaint. In Workin It Out, two figures struggle to stay upright while occupying the same space on the ground. They hold each other in a tenuous “v” shape. In this piece, Halton gives us an icon for the demanding work of relationships- the ever shifting conditions, and quite literally the struggle to maintain balance. Workin It Out, ink on paper 14 x 11"
Notably different than Halton's other pieces in the show is her black and white print Estoy Aqui, I Am Here. Here she has written “Estoy Aqui, I Am Here” several times in large, hand carved letters that run together. This piece feels more like the evidence of promise or ritual, almost like a blessing that would hang above a family fireplace. From the artist's statement we learn that this work speaks directly to the artist's intention during her residency in unfamiliar surroundings, where she was unable to communicate in Spanish. By committing to the work she shared with the artisanas, and by focusing on the commonality of their experiences, she was able to hurdle these obstacles toward meaningful interaction. Did You Mean It? Ink on paper 14 x 11"
What I find really compelling about Halton's work is the sense of humor and optimism that she successfully portrays in her pieces. The viewer may recognize herself among these earnest characters, and smile at their self-absorbed foibles. However, Halton's work also portrays more serious issues: isolation, loneliness, frustration over not being heard or understood, rage against a another group of people, the insidious corruption of racism. Here Halton's humor has a deeper purpose: to offer a hopeful point of view, and to underscore the theme of the “Encounters” show. The theme that is, if one commits and perseveres through the difficulties and awkwardness that arise when people encounter differences in each other, the reward will be a deeper understanding of our common humanity. Estay Aqui, I Am Here, relief print, 15" x 12"
Tags: Mia Halton, Halton, Creative Alliance, Baltimore, Baltimore art, baltimore artists, Encounters, clay, ceramics, art, fine art, sculpture, figure sculpture, drawing, print, printmaking, painting, Sculptor, woman artist, women in art, female sculptor, female artist, female sculptors, Puebla, Talavera, artisanas, Mexico, figure, figurative, figure drawing, mindfulness, presentness, committment, face to face, workin it out, did you mean it?